The guiding principles of the Reality, Virtually Hackathon rest on interdisciplinary teams. Networking with new people, and exposure to new ideas and skill-building workshops set the stage for impassioned individuals to fuse into teams, with each team sharing a common vision to implement an impactful, original idea. The distillation of the approximately 400 unaffiliated people into teams of up to five individuals produces a creative dynamic, resulting in unique applications of immersive technologies to create ingenious, never-before-seen XR experiences and applications. 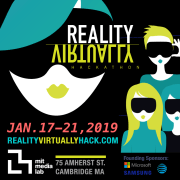 The Reality, Virtually Hackathon is a purpose-built hackathon community of 400 participants selected from approximately 1,600 applicants to create original cross reality (XR) work. The hackathon is a learning experience that deepens the extended community’s understanding of how immersive technology can be applied to solve real-world problems. It takes place in the iconic MIT Media Lab, overlooking the breathtaking Boston skyline in the heart of Cambridge’s tech scene-- a setting that inspires the most creative work. Would you recommend GRASSROOTS DEVELOPER EDUCATION INC?